The Judgment of Solomon remains one of the most famous wisdom narratives in all of literature, recounting a ruling made by King Solomon of Israel between two women claiming to be the mother of a child. Once both women had told their side of the story, Solomon ordered that a sword be brought to slice the child in two so that each woman would have half - the only fair solution. One woman spitefully agreed, while the other begged that the child be spared even if he must be given to the other woman. Solomon then determined that the loving woman was the true mother and gave her the child. Buying a Sword offers a fantastic way to remember this dramatic story by providing a number of excellent Solomon swords in honor of this ancient king. 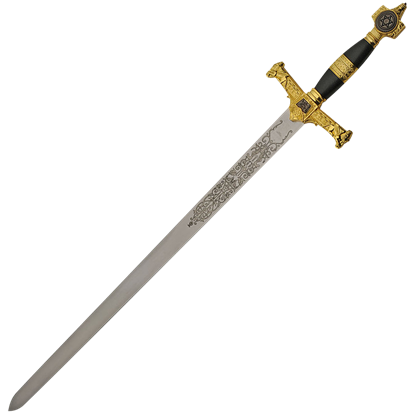 Our King Solomon swords come in a number of eye-catching styles with embellishments like gold and silver plating, ornate engravings, and mirror-polished blades. These decorative swords make striking display pieces and costume swords for re-enactments. Browse through our collection of ornamental Solomon swords to see the many stunning pieces we have available. 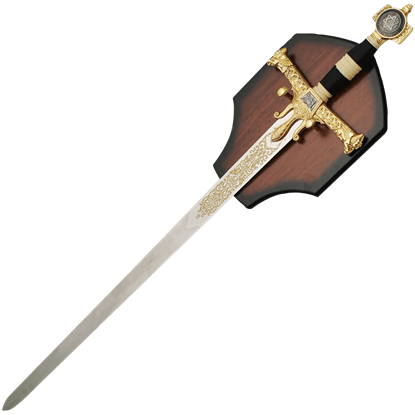 Recall the wisdom and power of the biblical king of Israel with the Black and Gold King Solomon Sword. 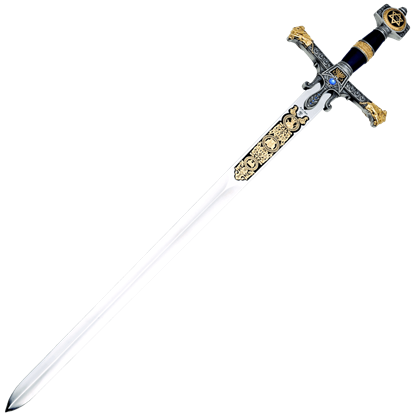 This display sword has a stainless steel blade with ornate floral etching along its ricasso and a deeply detailed gold tone hilt. Ruling Israel between 970 and 931 B.C., King Solomon was respected as a wise, fair, and powerful king. 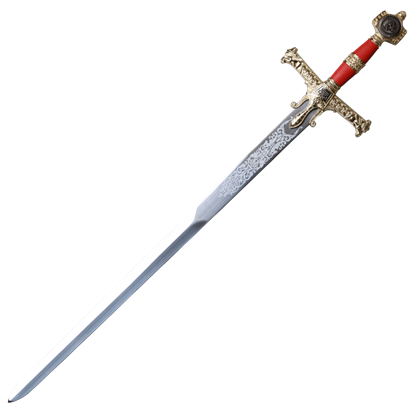 The Deluxe Sword of King Solomon by Marto of Toledo Spain, pays tribute to this biblical kings great spirituality and wisdom. Ruling Israel between 970 and 931 B.C., King Solomon was known and respected as a wise, fair, and powerful king. The Gold King Solomon Sword by Marto, of Toledo Spain, pays tribute to this biblical kings great spirituality and wisdom. With details inspired by the biblical King of ancient Israel, the Golden and Red Solomon Sword is a phenomenal addition to any sword collection. This decorative sword has intricate symbolic detail, and it comes with its own plaque. King Solomon of Israel was renowned for his wisdom and spirituality. Under his rule the monarchy experienced peace, prosperity, and cultural development. 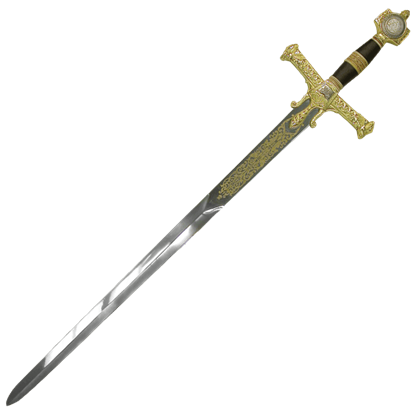 This Golden Solomon Sword pays homage to the biblical King of ancient Israel. The prophet Solomon appears in many famous religious stories. 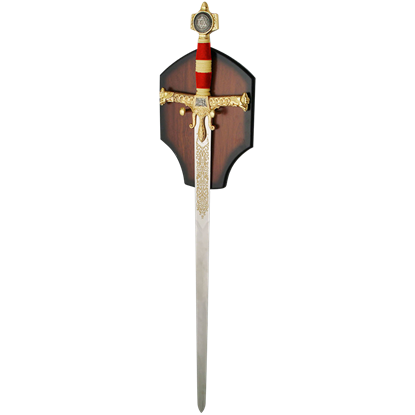 Our Red and Gold King Solomon Sword is modeled after this iconic figure and features a stainless-steel blade with red and gold accents for a stand out display sword. 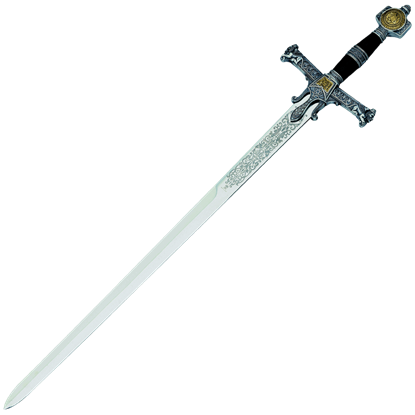 Few swords can claim to be as fit for a king as a sword of King Solomon. 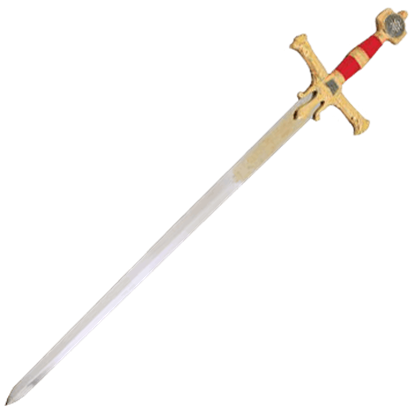 Rich in its ornamentation, the Red Sword of King Solomon is a regal blade that commands nothing less than the great respect that is deserved by a great ruler. Few swords can claim to be as fit for a king as King Solomon Sword, a richly detailed and ornamental blade that nonetheless can command great respect. 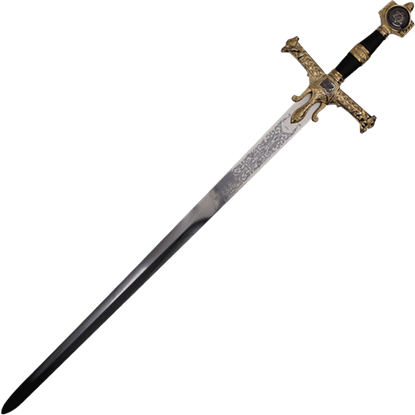 Grand and kingly, the Black King Solomon Sword is a blade fit for royalty. Ruling Israel between 970 and 931 B.C., King Solomon was known as a wise, fair, and powerful king. 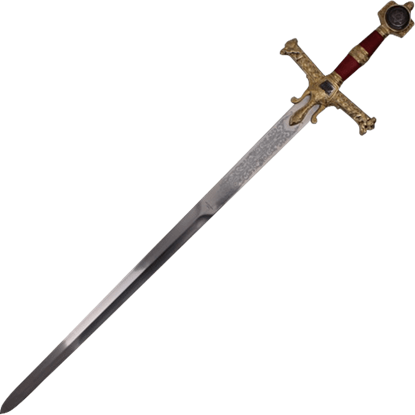 The Silver King Solomon Sword by Marto, of Toledo Spain, pays tribute to this biblical kings great spirituality and wisdom.